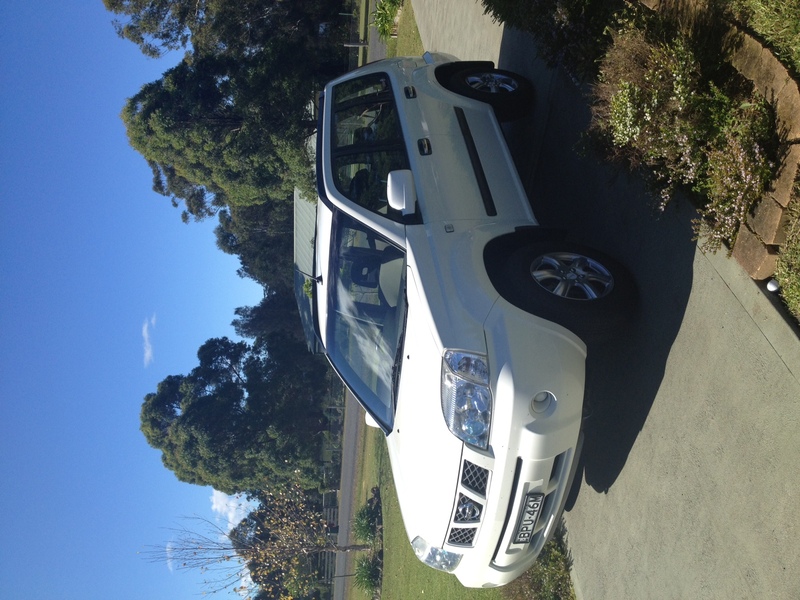 Yesterday was my first time driving our Nissan X Trail that we just purchased in Australia. We found a really great deal and bought it off the internet! I never did a test drive, leaving that to Greg. See, I have a confession: I’m scared to drive in Australia. First of all, the traffic drives on the opposite side of the road to America. 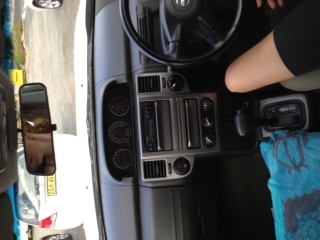 The actual steering wheel is on the right side of the car as well. Everything about driving here is counterintuitive to me. I’m looking over my right shoulder when turning right only there are no cars coming from that direction. They are coming towards me in the lane to my right! There are traffic circles everywhere and I have to pay attention to stay in my lane and give way to traffic on the right as I use them. Then, there’s the blinker. It’s located where I’m normally turning on windscreen wipers in a rainstorm. So, instead of cleaning the glass each time I need to turn, I find myself concentrating very hard just to flick them with the proper hand when I need to signal. As we are living in a small country town with Greg’s family until our furniture arrives and we settle in Newcastle, I decided it’s a good place to practice my driving. We went into town to the Medicare office and to the beach, only about a 15 minute drive. Luckily, I didn’t have to parallel park and pulled straight into a spot. I had Greg at my side, the left, no doubt, as I was driving and he was a great help to me. He kept reminding me where to look and encouraging me that I was doing great. My oldest son, Brett, said when we arrived back home, “Mom, I know a sign that you did well: we are all still alive!” Thanks for the encouragement, son. 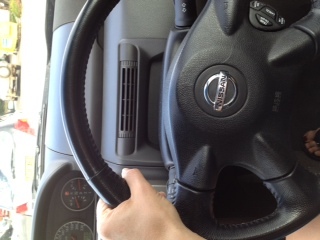 I found myself dreading every turn and traffic signal and wondering how long it would take me to get used to this. There will be a day that driving will be second nature just like it was in America. After practice in different cities, day and night, heavy traffic and light, I know I’ll wake up one day and know that I can do it and won’t second guess myself anymore. It’s much the same with God when we have just given him the steering wheel of our lives. If we have always been a worry wart, it feels odd to suddenly surrender control and trust a God we can’t even see with our present and future decisions. Going to God in prayer feels unnatural when we have been seeking our own common sense our whole lives. To step out in faith feels scary at first. We can find ourselves looking over our shoulder for impending threats. Even using new “Christian lingo” feels odd like putting on a pair of shoes that haven’t quite molded to our feet. At every turn we wonder if God is really there. Before we truly know the voice of God in our lives, we have to rely on mentors to help guide us. We must make a concerted effort to trust and believe what we are being taught. Like using a GPS to help us drive, we must form new habits that will guide our Christian walk like going to church and reading our Bibles. We may even have to research things a little further and use our concordances more often. Scripture isn’t yet memorized and our road map might seem confusing at times. With time, however, as God shows himself faithful to us, we begin to know the still small voice that belongs to our Savior and we can quickly respond when he calls. Even when we have doubts, our confidence comes from a proven track record and familiarity with his ways. As I look back at the last decade of my walk with God, I have trusted him with more and more of myself. I have begun to trust God wholeheartedly with my finances and my future. Things that once felt so hard like giving a tithe, are now second nature to me. Based on experience traveling with God, I now know scripture like I knew my way around Cedar Park. Hearing God’s voice is as reassuring as the nice Australian lady on the GPS; I now know I can trust him. As I get more familiar driving in Australia, I will be praying for those who are just getting familiar with our Savior. I will be conscientious of the roads while at the same time never forgetting what it feels like to be a new believer. If you know me, you know I’m an extrovert; I like having people around for everything! When Greg and I committed to plant a church in Australia, one of our first prayers was that God would send people with us so that we wouldn’t have to journey alone. I envisioned these people would be from Australia, not America. From the beginning, when these families told us God had been speaking to them about Australia, we would smile and encourage them (answer to our prayers). However, Greg and I would secretly feel like it couldn’t possibly be. I mean, how would they get visas? One family has a toddler and a baby on the way. Two of the families have FOUR kids each. How would they get jobs? The questions were endless. Walking on water seemed more likely to happen than this! I truly thought their excitement would wear off and they wouldn’t actually follow through. Call me doubting Thomas. A major breakthrough built my faith while we were in Australia in November. One family who was visiting with us sent the husband into a recruiting agency while we were walking down the street. After 45 minutes, he came out grinning ear to ear. Industry is booming (check out this blog) in Newcastle. There’s no doubt that he and the other guys can get jobs. The recruiter will help them get visas and the company who hires them might even pay for the move! The guys have since had a Skype interview to talk about their qualifications and hiring potential. After all of this walking on water, my excitement is sometimes like a roller coaster. I take a step of faith and get excited about how much quicker things will move with a team by our side. Then, a storm comes and I start to sink. Hurdles show up out of nowhere like when one of our couples had a close family member receive a cancer diagnosis. This seemed like it would halt their plans to come. All of this made me feel like the grandiose visions were just fantasy. I mean really. Are we all having an early mid-life crisis? No sooner than I put my eyes on Jesus taking a step out into that water, I doubt again, thinking when the rubber hits the road, they may not actually come. Our little team has been meeting as a group and every time, someone brings news about how God is confirming the decision to go. We started the year praying and fasting for 21 days. After the fast, we gathered for a night of prayer and worship and God moved powerfully continuing to shore up our faith. These families are making daily choices to move themselves in the direction of Australia. One family of SIX whose lease on a 3500 square foot home ended in December downsized to a two bedroom apartment (with FOUR KIDS) saving money and beginning the purging process this move will require. Needless to say, I believe they are all coming! As we are in the very midst of a miracle in our own lives, Greg and I are humbled that these wonderful people are picking up their lives and moving to the other side of the world to help us fulfill the vision God has given us for Lift Church. It comes with great responsibility and we take it very seriously. We will go even if they do not. But we are thankful God heard our prayers! We are doing our best to keep our eyes on Jesus as we step out of the boat. Sometimes God speaks so clearly that you “know that you know” what direction to turn and how to proceed with important decisions. If you’ve been reading my blog, you know that’s what happened with regard to us planting a church in Australia next year. We have no doubts that God has called us! There are other times when we pray and seek God for direction and we don’t really feel like He is directing us anywhere! All of our options seem pretty good. There’s no clear indication it’s a mistake no matter which way we choose. One of my favorite scriptures is Psalm 119:105. It says that God’s word is a lamp unto my feet and a light unto my path. Two significant thoughts arise from this simple phrase: one, that God only illuminates the next step that is in front of us- a lamp isn’t very bright and doesn’t allow us to see very far ahead. Secondly, there’s no point in lighting up our feet for the sake of staring at them! I’m pretty sure we need a lamp at our feet because we are moving them somewhere and we need to see where we are stepping. So many times, Christians I know stop themselves from making decisions because they feel God hasn’t spoken to them. They are “praying” about “IT” for ages. At some point, we have to start moving in a direction. God can’t make our feet move. He can’t steer a parked car. We have to trust that when we are praying and seeking God while pressing forward that He will let us know if we are making a wrong turn; we can then switch directions. I call this a closed door. God will close a door, meaning we will hit a dead-end if we are not supposed to step in a certain direction. He is faithful and God is not going to allow us to mess up our future because we step out in faith in something we are seeking Him about. As Greg and I began to pray about where God would have us plant a church, we had no “aha moment.” Literally, we began to research a city we like for its location on the map and proximity to both Sydney and Forster, where Greg’s family lives. Newcastle, New South Wales, has a population of about half a million and we love that. There are beaches and lakes and the weather is wonderful. We did a hundred Google searches and Greg spoke to Aussies who know the area well. While he was in Australia at the Hillsong Conference in early July, he asked pastors who have lived in the region for years what the spiritual climate and churches are like there. He even met with a city planner in Newcastle to talk about the economy and growth potential. All lights were green. God hasn’t written the word Newcastle in the clouds for us as of yet. Our decision may not sound super-spiritual but He certainly hasn’t closed any doors. So, we are moving forward, one lamp lit step at a time towards moving to Newcastle, NSW, Australia next summer to start a church! It Seemed Good to Me! We don’t have Bible college degrees. We weren’t raised in Christian homes. We can’t lead worship or play any instruments (every church planter we know seems to be musically inclined)! And besides, Hillsong has Australia covered, right? Every disqualifying factor we could come up with plagued us. Once again, when we bring our concerns and petitions to the Lord, He is so faithful to respond. On April 6, at the ARC church planters conference in Baton Rouge, Greg was encouraged about his specific perspective, personality, and purpose in Australia. Ironically, our very own Pastor Joe was preaching when the revelation came! In Luke chapter 1, Luke uses the phrase, “It seemed good to me” as he talks about giving his specific account of Jesus and the gospel. Luke was a physician, not a Bible school graduate)! He brought a different angle and perspective than Matthew, Mark, and John to what they witnessed. Have you ever wondered why there are four gospels? Why did God want four accounts of the same time and events surrounding Jesus’ life? EVERY testimony is important and unique. EVERY story of Jesus touching a life matters and should be told, including yours and mine. Greg has an amazing life transforming testimony of what God has done in his life. He moved to America as a 19 year old Atheist who had never seen a Bible. He felt he had no need for God, that he was quite capable of managing himself; he believed anyone who put his trust in a God he couldn’t see must be weak in himself. At age 26, Greg stepped out in faith and was radically changed forever as he accepted Christ as his Savior. He has never been the same and the quick work God has done to raise him up and use him to influence and change lives is amazing to witness. His passion for the local church and his willingness to obey God in every area of his life is awesome! Greg and I, just like you, have a story that needs to be told. There are 22 million people in Australia. Millions of them do not have a personal relationship or revelation of Christ. It seems good to us to bring our account of the gospel to Australia. We believe it will be used to impact thousands of lives as we plant a church. God’s response to Moses as he questioned his call was, “I will certainly be with you.” God is certainly with us. Nothing is too big for God! Greg and I really started fervently seeking the Lord on this whole Australia thing at the end of January. It wasn’t long before a clear direction and confirmation came. Greg attended the C3 conference in Dallas February 16-18th. During one of the services, Bishop TD Jakes was speaking and Greg heard the Lord say, “You are going to plant a church in Australia.” Greg describes this moment as an overwhelming impression, not an audible voice. I wasn’t there and I’m not Greg but what I DO know is that my husband called me at home and told me the exciting news! He said he cried throughout the message Bishop preached. His tears came from being overwhelmed with the presence of God, a download not from the stage, but straight from heaven. It had nothing to do with what was being preached, rather an intimate moment between our heavenly father and Greg. I heard a confidence in his voice that wasn’t there before. Somehow he just knew it was God. I tried to pinpoint what exactly happened… part of me wanting to talk him out of it or maybe justify his emotion some other way- maybe he was just tired? Maybe he was homesick? I knew deep down none of this was the case. It was the confirmation we had been seeking. By the time I hung up the phone, I had total peace about this monumental decision. God was asking us to GO! I am very thankful for this pivotal weekend. God is so kind to give us this landmark day where He moved powerfully in that service; we will forever hold onto this experience. All of us can have moments like this where God speaks in a clear and direct manner about our futures. God converses with people just like you and me all throughout the Bible. He also stays silent for hundreds of years at a time! What makes the difference for God to speak or not? One common characteristic among those who hear from the Lord is that they are “soft-hearted.” Greg is one of the most open and “soft-hearted” people I know. Some might call him a “crier.” If you have ever seen him in worship or heard him talk about his kids or really anything he loves, you will probably see a few tears. I LOVE this about my man. I believe God loves this quality too. The Bible says in Mark that Jesus is grieved by the hardness of the people’s hearts. What we can find over and over again is that God desires us to have an open heart towards Him. We can all maintain this by daily asking the Lord to forgive us for our sins. We should spend time with God- read His word, pray, and seek Him. We have to forgive others who have hurt or betrayed us. The easiest way to harden our hearts is to harbor unforgiveness towards someone. To keep ourselves softened to the voice and will of God, we must walk humbly and serve others. I believe God desires to use each and every one of us for His glory. He wants to send us out into our communities, schools, workplaces, churches, and mission fields to spread the gospel and unite with other believers to make a difference. To lead others into a saving relationship with Jesus Christ, we must be open vessels before the Lord. I’m thankful for my husband’s soft heart! I’m thankful for a husband who isn’t afraid to open himself to his family and friends. Most of all, I’m thankful he is open to the Lord. Even if it does mean we are now moving to Australia!